Does your letterhead blend into the background? Are you worried that your business letters are not being taken seriously or your correspondence going unnoticed? Letterhead printing from Avanti Printing will give your company’s letterhead the boost you need have your correspondence stand out and get the attention it deserves. We provide superior letterheads printing services to enhance your image and support your branding efforts. Nothing states outstanding professionalism like customized letterhead. Establish the professional nature of your business by allowing us to provide you with custom letterhead printing that impresses the reader long before they peruse the contents. Well designed letterhead printed on quality paper projects an image that instills confidence in your current and future customers. We offer full color letterheads printing that truly convey the quality of your business or services. Our custom letterhead is also great for personal stationery and will make letter writing to customers and clients personal and professional. What Goes in a Letterhead? While every business is certainly different — and you may want to emphasize something your competitors do not — several things should be part of every standard letterhead. Beyond those standards, you may also want to include other things. Some businesses make separate letterhead for each person in the company and put their names somewhere at the top. Others like to include a slogan or company motto. You can play around with bits and pieces to add and subtract to differentiate your design from others and make it reflect your company branding better. Be sure to lay all these things out with appropriate spacing. While you may want to keep all of the contact information grouped, you could certainly put the company logo and motto on the opposite side of the paper to give it a more balanced look. The main thing you want to do with letterhead is to provide people who receive your correspondence a means for recognizing who sent the letter and contacting you if they have any questions. Assembling the information needed for the letterhead won’t take you much time — you probably have business cards with similar information already on them. However, deciding on the right layout can be more of a challenge. You will need to emphasize certain things over others, which means making a call on which information is the most important. For instance, you will probably want the company name printed in the largest type — people need to be able to identify it quickly. You can choose smaller sizes for other information, but don’t go below 9 pt. Anything smaller will strain the eyes, and older customers may not be able to read it. Generally, 10 to 12 pts is the best size for most of the information on your letterhead. Choosing a font marks another critical decision. You want your font to reflect your business’s brand identity, as well. If you sell a product that’s pretty straightforward and doesn’t lend itself to humor, choose a no-nonsense font and skip the ones with swirls and flourishes. You should also decide whether you want your letterhead to appear formal or informal. Generally speaking, serif fonts convey formality. This family includes Times New Roman and Century Schoolbook. San serif fonts, like Geneva and Helvetica — which do not have “feet” on their letters — are less formal. Use your brand identity to guide your choice. A law office may want to stick with serif, while san serif could be more appropriate for an amusement park. Should You Use Color on Your Letterhead? 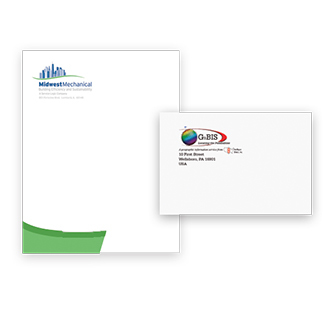 For the most part, we would caution against using color paper for letterhead. This may seem like a fun idea to make you stand out, but the truth is it just comes across as unprofessional. Stick with white paper or cardstock. When someone opens a piece of mail from your company, you want them to see the embodiment of your business in stationery form. That means choosing elements of design and appearance that align with your brand identity. Brand identity encompasses everything from your attitude toward customer service to the quality of your product to the culture of your office. You want brand identity to be encapsulated by everything you use for marketing, such as your logo, slogan or, yes, your letterhead. The Quality of the Paper: Choosing high-grade paper tells people where you choose to invest your money. Some businesses prefer to make that statement by going with a lower grade, which shows their focus is on services. The Busyness of the Design: Spare design can express volumes about your company’s attitude. A more cluttered design can also indicate creativity. Decide which will speak to your customers. The Playfulness of the Layout: Some companies want to be seen as fun and playful — Disney comes to mind — but others don’t. If you own a funeral home, for instance, you want a straightforward design showing you take others’ grief seriously. Capture the attention of your recipient with your full-color logo, slogan or tagline to set your business apart. Several options are available for letterhead printing, including paper and ink colors, a watermark on the page or your logo used as watermark and embossing. You can create your own letterhead using the online design center on our website and order online or let us create unique custom letterhead for you. When you work with us, you receive a lot of advantages you may not find from other printing companies. For example, we fulfill large-volume orders for our customers in Orange County and beyond. We also offer fast turnaround times. Your time is valuable, and you don’t want to wait too long for your materials to reach you. We can also assist you with your creativity and design. Our goal is to provide you with the printing solutions you need, while also aiding you in preparing the best product. We can work with you on your letterhead until you have a design you’re not only satisfied with, but excited about. Contact us by telephone or request a quote right here online. Request A Quote For Letterhead Today!